Simple elegance, perfect proportion, classical detail. These are the essence of the Federal style in architecture, interiors, and the decorative arts in the period 1780 to 1820, when the United States was a new nation looking to establish its own cultural identity. 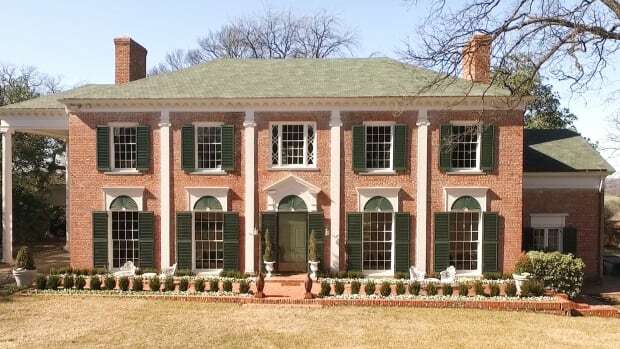 It is a remarkable period in history when Americans mastered classical design and made it their own. 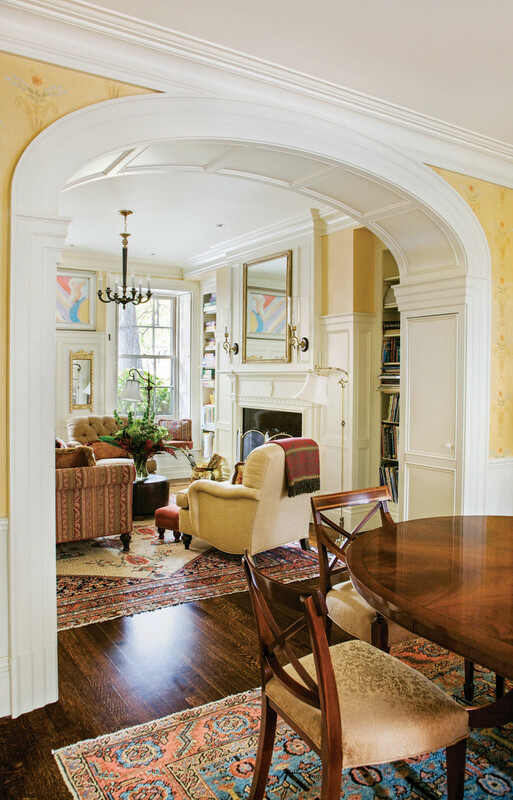 Sally DeGan principal of SpaceCraft Architecture restored this Beacon Hill Federal rowhouse. 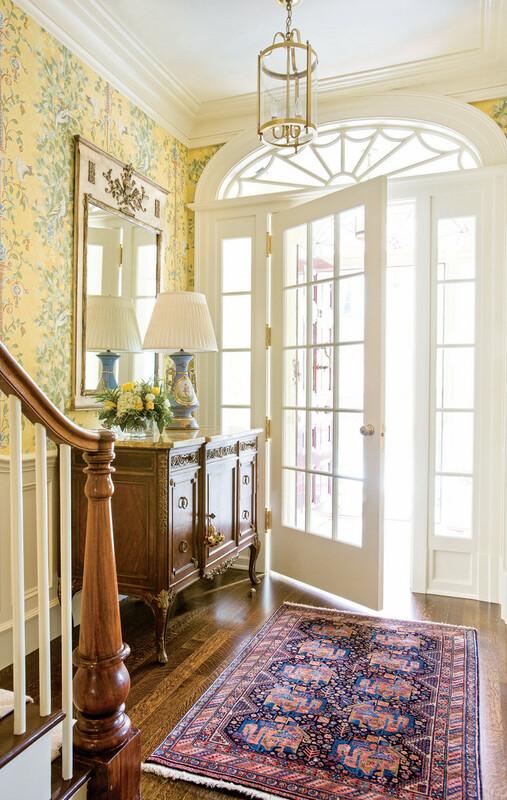 The entryway has classic sidelights and transom—hallmarks of the Federal style. Along the eastern seaboard, maritime communities growing rich on trade were ready to display both their wealth and taste. 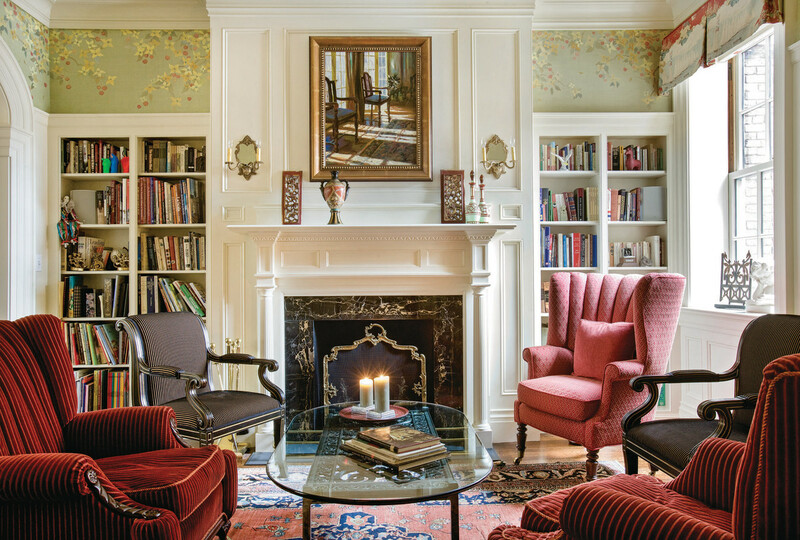 From Portland, Maine, to Charleston, South Carolina, architects, woodworkers, plasterers, masons, paperhangers, and upholsterers produced houses and interiors of extraordinary beauty and refinement. These designers and craftsmen were inspired by the classical forms and ornament of the Greek and Roman past as well as the newly fashionable English works of Robert and James Adam. Among the leaders in this artistic flowering were the architects Charles Bulfinch, Samuel McIntire and Russell Warren, to name just a few. Each of these talented individuals had an unerring eye for clean lines, flat surfaces, the subtle use of ornament and the sublime use of oval shapes for entire rooms, staircases and door fanlights. In their hands, less was truly more. Interior shutters were a popular feature of Federal Style houses in the 1800s. Charles Bulfinch (1763-1844) worked in both Boston and Washington, D.C. His most prominent project in New England was the Massachusetts State House (1789) on Beacon Hill in Boston. The building’s golden dome, inspired by ancient Roman temples, dominates the city’s skyline and fulfilled Bullfinch’s vision to make it a classical metropolis. The rich, powerful, and socially prominent then began to settle nearby. In his three houses for Harrison Gray Otis, built in 1796, 1800, and 1806 on Beacon Hill and on Beacon Street, Bulfinch’s simply elegant Federal Style defined the character of Boston’s most fashionable district. The first feature to capture one’s attention in these houses are the fanlight doors. These are the hallmarks of the Federal style. Based on a half oval, these over-door windows contain numerous versions of delicate tracery in wood and/or metal, creating a fan-like shape. Set against plain brick walls, these fanlights served as the centerpiece of a building. Slender classical columns framed these masterful entrances, focusing attention on the fanlight. In the evening, the tracery caught the interior lighting, creating a magical web-like pattern. Today, one can still wander the streets of Beacon Hill and be thus entertained and enchanted by the discreet show put on by these doors. A view into the living room of this Federal Style house. 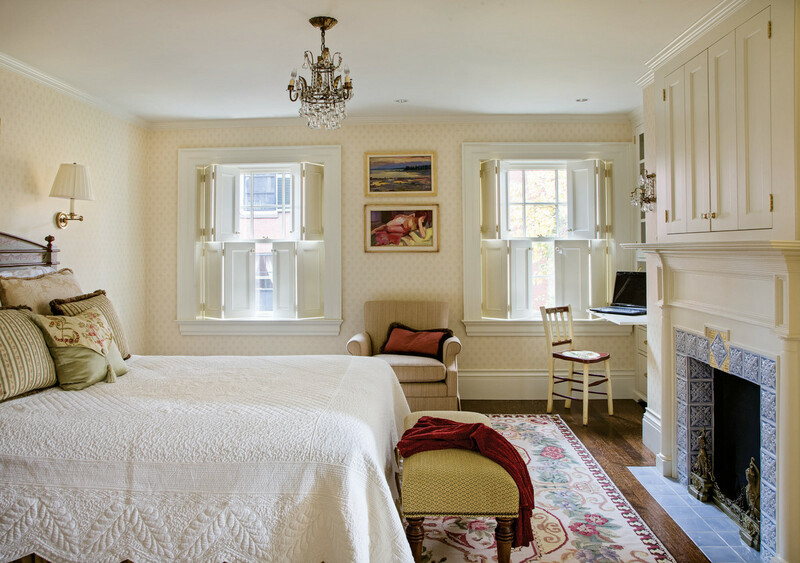 Note the classical detailing throughout the rooms. Salem, Massachusetts, offers another remarkably intact Federal era neighborhood known as the McIntire District. The great mercantile families of Salem tired of houses too close to commercial wharves and chose in the early 1800s to relocate to broad new tree lined streets. Essex, Federal, and, most distinguished of them all, Chestnut Street, comprise a Federal era time capsule. Although many accomplished builders worked in the area, the name of Samuel McIntire (1757-1811) is legendary. Born in Salem, McIntire rose to become a superlative wood-carver, architect and furniture maker. Such was his influence, and ability, that the entire Federal-era district is named in his honor. McIntire designed several fine houses and public buildings, among them Hamilton Hall (1805), but his masterpiece is the Federal Style Gardner Pingree House (1804) on Essex Street. The house is a simple three story cube in red brick with a centrally placed door featuring a fanlight with gilded metalwork, a rather grand gesture. The gilding bespoke of the position of the Gardner family who commissioned their house at the height of Salem’s prosperity as a commercial seaport. McIntire also produced delicate wood carvings for the interior, notably the sheaves of wheat and garlands of flowers for the fireplace mantels. 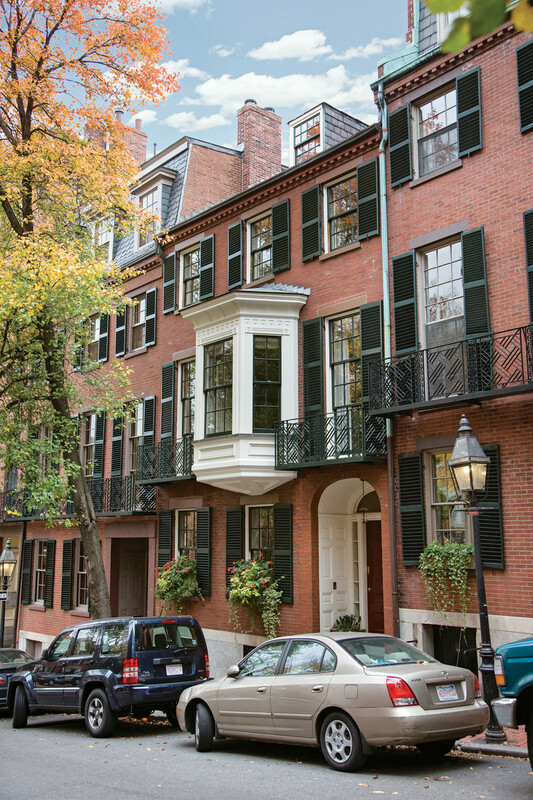 Beacon Hill in Boston is home to several Federal townhouses by Charles Bulfinch. While Bulfinch and McIntire developed a refined form of architecture and decoration in Massachusetts, something very different was afoot in Bristol, Rhode Island. George de Wolf, a general and one of the wealthiest seafarers and slave traders in the nation, engaged Rhode Island born Russell Warren (1783-1860) to build a house in the center of town. 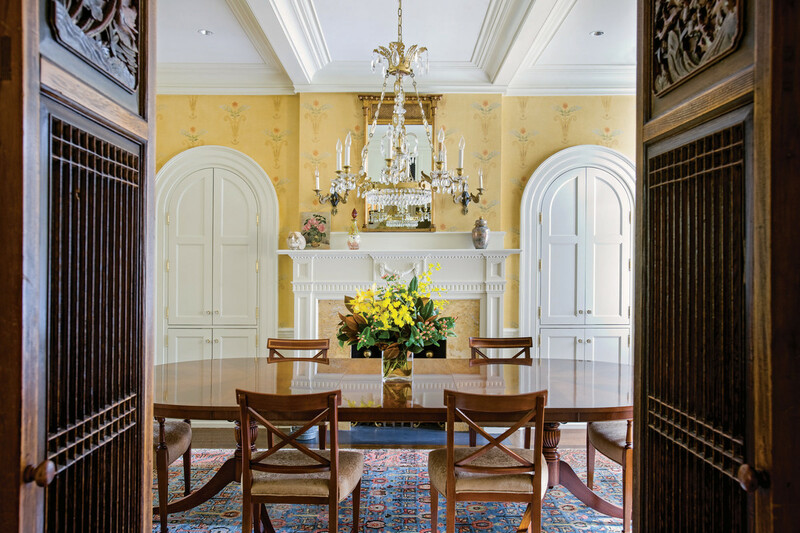 With four soaring Corinthian columns, floor to ceiling windows and elaborately patterned railings, Linden Place is one of the most opulent versions of the Federal style in the country. The front door is surmounted by a fine fanlight, which, in turn, is topped by a fanlight window on the second floor above. A series of ovals and half-ovals interlock within these windows, conjuring up the most intricate patterns. It is a tour de force. The dining room in the townhouse has built-in cupboards. New England’s merchant oligarchs were important early patrons of Federal Style designers but Southern planters were also quick to produce their own versions of the style, one of the best examples being the Nathaniel Russell House in Charleston, South Carolina. The main façade is an understated affair with two windows at either side of a beautifully proportioned door. Inside, a true masterpiece awaits. Oval rooms are placed at the very center of each floor. This shape especially appealed to Federal-era designers for its elegance and adaptability. An oval form may be elongated in a way a pure circle can not. The oval was the basis for fanlight windows and, at the Nathaniel Russell house, for the elliptical staircase which rises the entire three stories of the building. No ornamental carving appears on the stair balusters or newel post. Only the smooth continuous line of the oval is seen from the first step to the last. 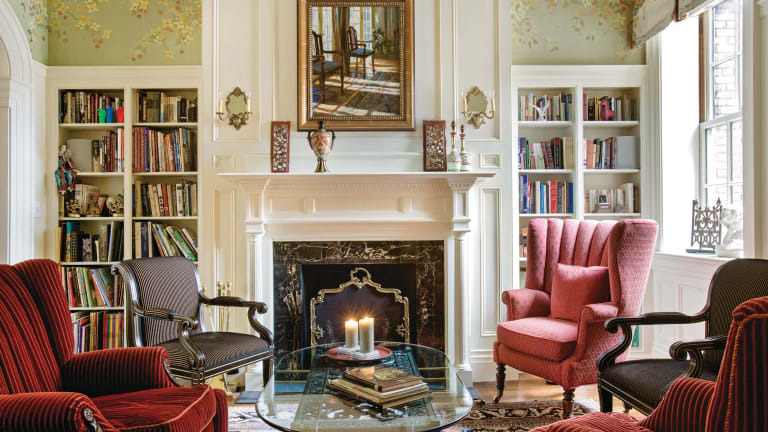 The Federal Style mantel in this Beacon Hill home showcases Classical design. Note the fluted columns adorning the mantelpiece. 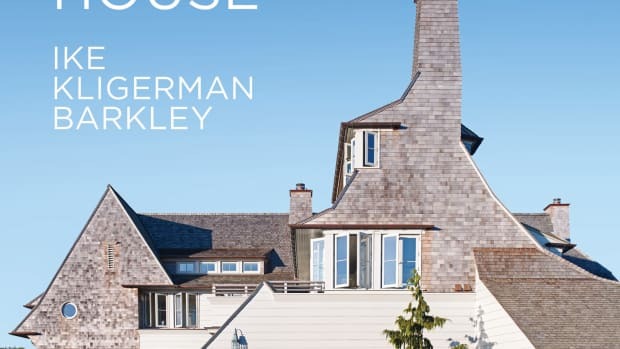 The Federal style house was a triumph of simplicity and classically refined ornament. It suited the hopes and desires of an emerging nation. As the country progressed into the 1820s, new aspirations arose giving way, as they always do, to a new style, the Greek Revival, more massive, heroic in scale than the delicate fanlights and ovals of the Federal style. Time marches on, fashions change. What does endure is the legacy of superb design and craft. That is the gift of the Federal style to America.